This post was originally published May 4, 2018 and has been edited to be up to date on rules and regulations due to the new policy change. Last revised June 1, 2018. VA IRRRL (Interest Rate Reduction Refinancing Loan) are rate and term refinances only, which can result in incidental cash back of $500 depending on the interest rate and loan costs. Veteran homeowners who already have a VA loan have access to one of the simplest loan programs that have significant benefits. No appraisal, no income, or credit score required. Generally more competitive interest rates than conventional loans, which means savings in the long run. Fee recoupment – lenders have to provide a recoupment statement in accordance to VA 26-18-13, which certify that fees are recouped on or before the date of 36 months after the closing date. Net tangible benefit needs to be .5 percent less in interest rate than the previous loan if the loan is a fixed rate. In the case that the loan is changed to an adjustable interest rate, the net tangible benefit must have an interest rate that is not less than 2 percent of the previous loan. The mortgage payment must be current for one month. When applying the savings to the term, principal and interest cannot exceed 20%, but can increase more with documentation. The loan must originally be a VA loan, which the borrower would have already used the VA loan eligibility. A Certificate of Eligibility (COE) is not required. 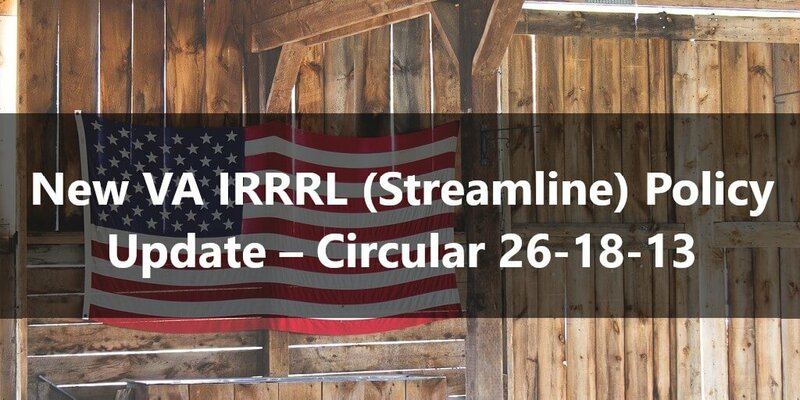 The VA IRRRL interest rate must be lower than the loan being refinanced unless the current loan is an adjustable rate mortgage (ARM) or the term is shorter than the one being refinanced. A VA funding fee is a percentage of the loan amount that is applied to every purchase and refinance that goes to the VA to help cover losses of loans that go into default. The VA IRRRL funding fee is.50% regardless of subsequent use, but partial or full waiver directed by the VA for disabled veterans (service –connected disability). The funding fee can be financed or paid at closing. Include owner occupied or investment, which can be VA-approved condominiums, 1-4 units, condos, planned unit developments, manufactured homes permanently affixed to the foundation (have to meet all VA requirements). No verification of income is required, but income must be stated on the application – no analysis of income is performed. Fixed rates only, which ARMS are not eligible in Colorado. First or second mortgage are subject to Texas Section 50(a)(6).